Perched on the shore of Melvern Reservoir about 30 minutes south of Topeka, Eisenhower State Park (ksoutdoors.com/State-Parks/Locations/Eisenhower) skirts the eastern fringe of the Flint Hills. This 1,785-acre natural area sports a subtle mixture of tallgrass prairie and woodland landscapes, and although it’s close to the city, the sheer size of it prevents urban encroachment. 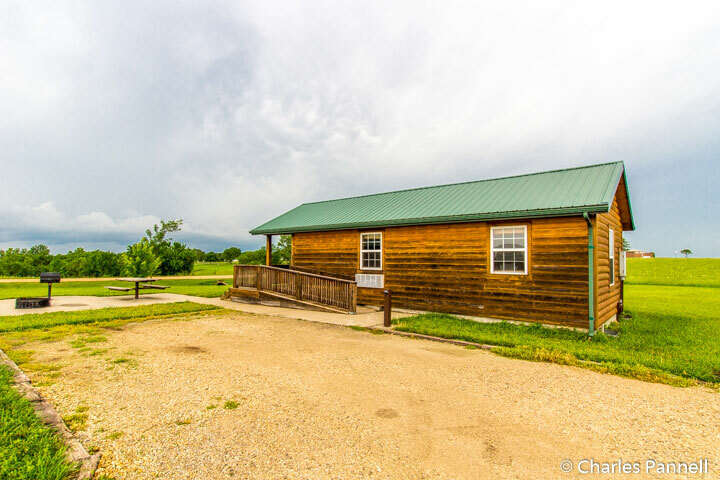 And with a nice selection of accessible cabins and trails, it’s the perfect spot to steal away for a little one-on-one time with Mother Nature. 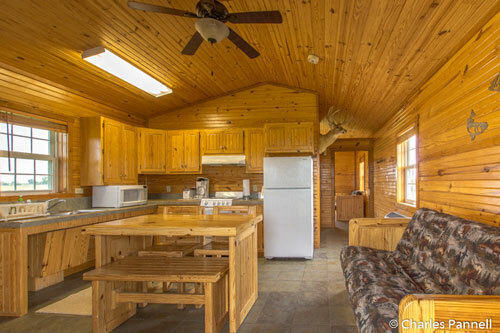 Although there are plenty of campsites in the park, there are also four modern cabins — all of which are wheelchair-accessible — that boast a bevy of creature comforts. That said, the best choice is Melvern Cabin, which features a good view of the lake and offers guests the maximum privacy. Ample parking is available in front of the cabin in a level dirt area, and although it’s not striped there’s plenty of room for even the largest accessible van. There’s level access to the front porch, and barrier-free access to the cabin through the wide front door. There’s good pathway access over the tile floors in this one-bedroom cabin, which can sleep up to six people. The bedroom is furnished with a 19-inch high double bed with good pathway access on both sides, and a 16-inch high futon. Additionally there’s and a 16-inch high fold-down Murphy Bed and a sofa in the living room. Granted, space is tight in the living room when the bed is open, but the bedroom is roomy enough for wheelchair-users. 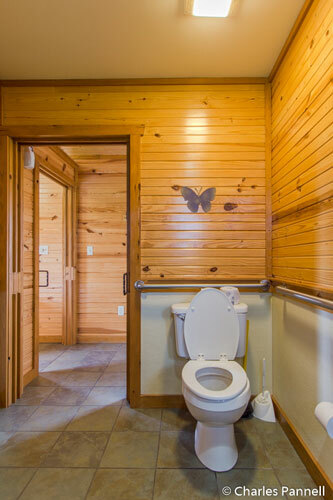 There’s a wide pocket door that leads to the spacious bathroom that features a full five-foot turning radius. 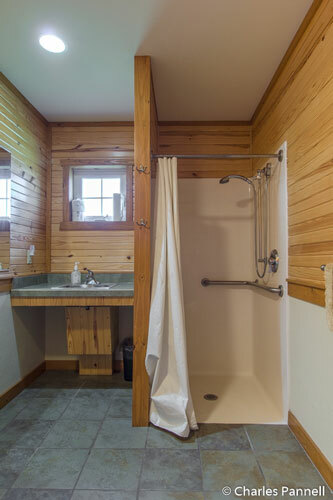 It’s equipped with a roll-in shower with grab bars, a hand-held showerhead and a fold-down shower bench. The toilet grab bars are located on the back and left walls (as seated), and there is also a roll-under sink with a lowered mirror in the bathroom. It should be noted that towels and bedding are not provided for the cabin, so you’ll need to bring your own. The kitchen is outfitted with a full size stove and oven, a microwave, a refrigerator, a toaster and a coffee pot. It also comes with a large assortment of pots, pans, dishes and utensils. There is a dining table with two chairs and a bench in the kitchen, and an accessible picnic table on a cement pad near the front porch. There is also a fire ring and a grill outside. 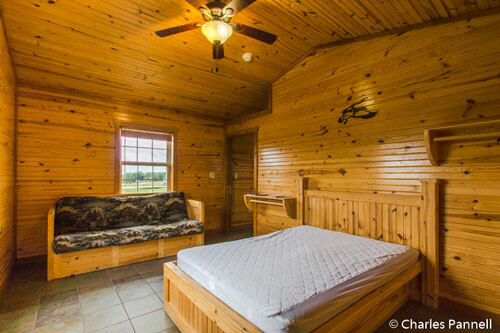 The cabin is quite comfortable, and makes a good choice for a couple or a family. The price is affordable too, at $65 — $95 per night, depending the day and season. The highest rates are on weekends from April to September, while the lowest rates are available on weekdays from January to March. Reservations can be made online at www.reserveamerica.com, or by calling the park office at (785) 528-4102. If you’d like to get a little exercise during your Eisenhower State Park visit, there are a few trails that will work for most wheelchair-users and slow walkers. At the top of the list is the interpretive trail near Doud Campground. From the Malvern Cabin, it’s best to drive to the trailhead. Head back towards the entrance on the main park road, then take the first left after Ike’s General Store. There’s paved parking near the trailhead on the right, and although there’s no striping there’s plenty of room to deploy a ramp. 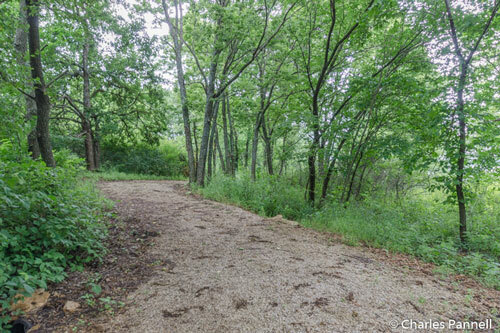 The crushed gravel trail has a slight downhill slope at the beginning, and some manual wheelchair-users may need a bit of assistance, but after that the loop trail levels out. 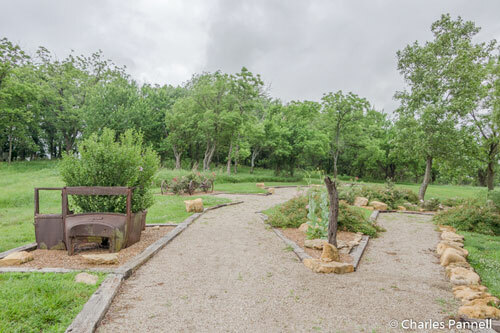 The shaded trail is flanked by wildflowers and it’s frequented by the resident deer. There are a few undulations and ruts along the way, but for the most part it’s doable for wheelchair-users and slow walkers. The road through Doud Campground also makes a nice hike for wheelchair-users and slow walkers. It’s paved and level offers an nice reservoir view as it meanders through the meadow. Some slow walkers might also like Ike’s Scooter Trail which runs from Doud Campground to West Point Campground. From 10 A.M. to 6 P.M. it’s reserved for scooters — the gas-powered recreational models, not the battery-powered mobility devices — but during the rest of the day it’s open to everyone. The 1.5-mile dirt track has a lot of ruts and bumps along the way so it’s really only a good choice for slow walkers. Remember to take along water though, as none is available along the trail. There’s also a small arboretum behind the office near the park entrance. The first part of the crushed gravel trail is wide and level, with barrier-free access from the adjacent kiosk. It’s a pleasant spot, but the access ends after the picnic table near the waterfall. After that there are rocks on the trail that prevent wheelchair access. Still the waterfall is pleasant, and you can get a good view of the garden from the trail, so it’s worth at least a quick stop on your way out of the park.